It should be pretty obvious to most folks that if they are going to participate in an auction environment that it will benefit them greatly if they understand the parameters of that environment. Even if you repeatedly bid on lots from the same auction houses or through the same online sources over and over; rules, regulations and formats can and do change. These changes, be they short-term or permanent, can yield areas of advantage for those who keep track of them and exploit the opportunity. Here are three examples where paying attention to small details likely helped win a lot. Oddly enough, all three of these examples are for Washington quarters and by this time I would expect quite a few to be aware that I have a long-held soft spot for wonderfully toned Washington quarters. The quarters were chosen as illustrations because I still own them and I do not like to write about coins that I have sold to clients. I will discuss these in the order of acquisition, which happens to also coincide with the order of emission from the US Mint. Two were obtained via ebay and one through a Heritage auction. Ebay has changed its search program a number of times and has also changed what information they require from sellers of certified coinage. 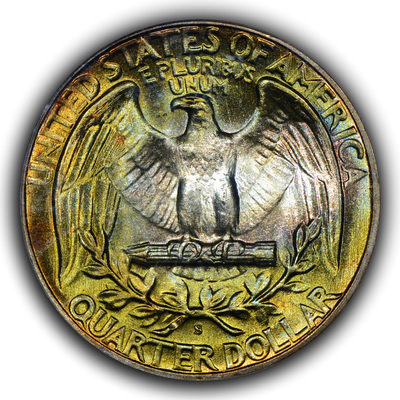 Way back when, in the early years of the new millennia, ebay required neither a full slab shot nor did they require a serial number for certified coins. Additionally, many sellers would use automated services to list their coins and some of these services essentially placed an image of the auction description up on ebay instead of actually typing in text that the ebay search program could scan. What this more or less meant was that unless ebay had been employing optical character recognition scanning in their listings, they would not be able to read the "image" listings. 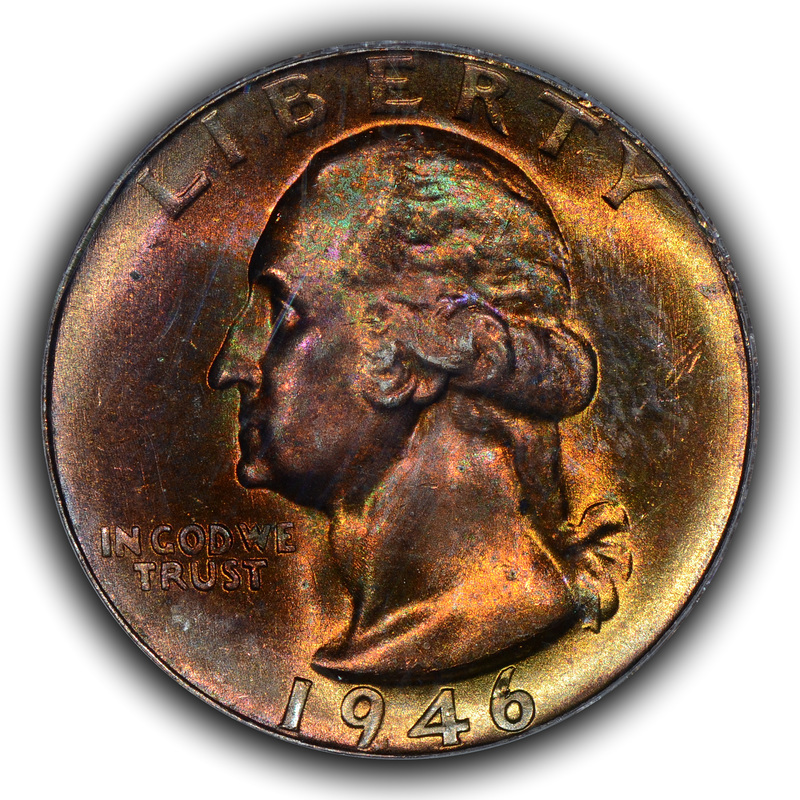 I had been performing one of the many ebay searches that I employ and the coin in question did not appear, but then I went through all the new ebay listings under the Washington quarter section ad n a coin titled "1940 Washington Quarter" came up and when I clicked the link I was amazed at what a nice coin was staring back at me on my monitor. 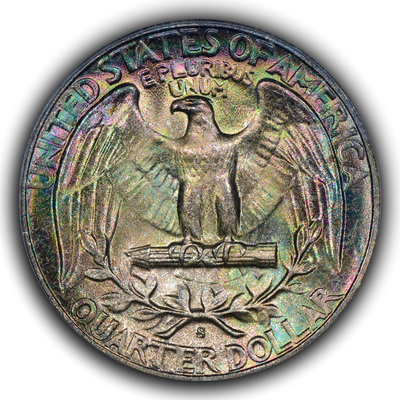 It was a 1940 Washington quarter in a PCGS MS67 holder and the coin had the most wonderful shades of medium green with some lilac sprinkled about over nicely lustrous surfaces. The coin was gorgeous, was fully described in the listing and the images were really quite good, but why had it not shown up in my search? I did extra searches using just "MS67" or "monster" or "neon" since the coin had been described using both of those adjectives in the written description. Regardless, the coin remained invisible to the ebay search and that was because, as far as I could determine, the third-party listing service used an image of the typed description that was being missed by the ebay scanning program. The coin had an opening bid lower than what a typical white, or so-so- coin would cost. I decided to sit on the listing and bid at the last moment. No one else bid and I won the coin at the opening price. Needless to say, I was quite happy when the coin arrived in my PO box. While this acquisition might rightly be viewed as simple luck, more went into it and that included an understanding of some quirks in the ebay scanning program. If not for that understanding, it is likely this coin would not have been seen by me in that listing. This next coin took a bit of strategic planning during the auction. At one point some years ago Heritage Auctions decided that their internet auctions would not end all at the same time, but would continue up to an hour after the declared ending time based upon how many bids the coin received after that time. It no doubt reads much more complicated than the auction set-up was in reality. Basically, all lots ended at 10:00 PM CST, but if you bid on a lot during the initial live period then you were entitled to place additional bids on that lot during what might best be described as "extra time". If no bids were entered on a particular lot over a ten-minute period of "extra time" then the lot closed. Regardless, all lots would close no later than one hour after the original closing time. I was busy during that auction and placed dozens of one dollar bids on multi-thousand dollar coins simply to be able to place additional bids, if I wanted to, after the initial closing time. One of those coins that I placed a low initial bid on was a wonderful 1946-S Washington quarter with a deep reddish-auburn obverse paired with a dramatically toned reverse featuring a mostly silver center framed by intense green. Oddly enough, I have noticed over the years at least a dozen 1946-S Washington quarters with similar toning, though never as dramatic, complete or attractive as this coin. This observation makes me think that they were all stored the same way and came from the same small hoard given their similar signatures. The lot closed and I was not the high bidder, but I had mapped out a plan to bid in such a manner as to allow the fewest bid increments possible and I waited as the first ten-minute time period was about to come to an end before placing my bid. I then waited, waited...waited! Ten-minutes went by and no one else bid and that terrific 1946-S was mine. I've often wondered if the person who was the high bidder at the traditional close of the auction realized that Heritage was running an experimental auction format where they had changed their bidding rules and I wonder if that person who had possibly thought they won the coin sat there in amazement wondering how it was taken away. My impression was that this auction format was not widely appreciated and Heritage, if I recall correctly, ended the experiment after a single try. No doubt if this forma was implemented that the return would have diminished as more and more people realized the vagaries of the closing times and formulated their own plans. For the last coin we again go back to ebay and to a seller who did not seem to care that he had his coin listed incorrectly. I had been cruising the Washington quarter section of ebay when a title caught my attention and the title said something like "Spectacular rainbow...". Well, I had to look and when the auction page opened there was an awful, dark brown, no luster and low end eye appeal MS Washington staring at me. I was about to close the page when I noticed that the Washington in the image was a 1948-S and the title of the auction stated it was a 1947-S. To those who study the Washington quarter series, the 1947-S stands out as one of the best issues for a combination of strike, luster, toning and overall quality. 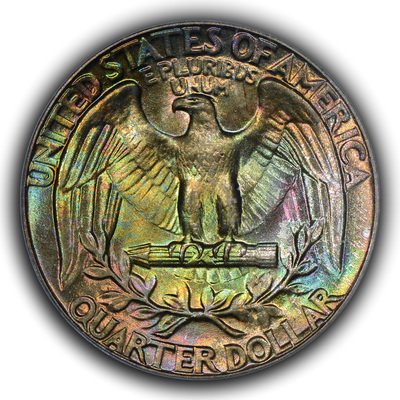 It might be thought of as the big tuna of Washington quarters in that it might take less searching to find a wonderful coin of this date than of most any other in the series. 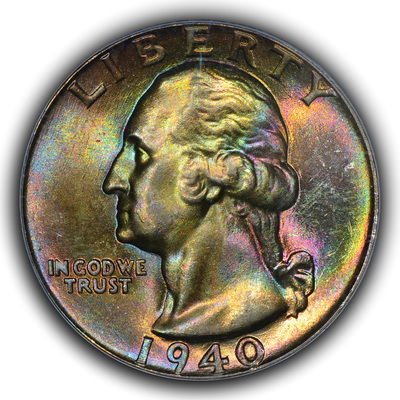 In fact, PCGS has graded multiple 1947-S Washington quarters as MS68, which is as high as PCGS is willing to grade Washington quarters and quarters at that grade level are truly scarce, if not rare, indeed. In contrast, the grade of MS66 is extremely common for a coin such as this, which makes the issue quite similar to the 1881-S Morgan dollar. Given the above, I thought that the auction image might be incorrect. To determine this, I copied the URL of the image embedded in the auction and changed the URL from its "1948S" text to "1947S" and then hit enter. 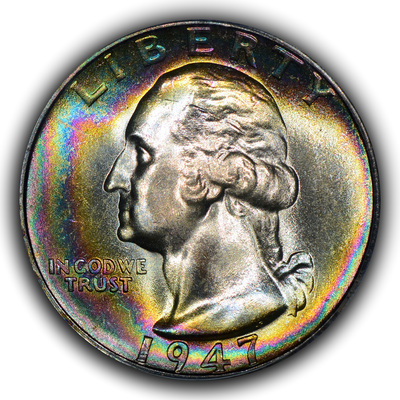 That did the trick as an image of a wonderfully toned 1947-S appeared in front of me. I immediately emailed the seller to tell him that he had the wrong URL up in his auction and that he would get no action on his coin. Two days later he did not respond and the image was still wrong so I emailed him again. My wife asked me why I would do such a thing since I desperately wanted the coin in the image...and...she had a point. Anyway, the seller neither replied nor did he change the image. I was the high bidder (and only bidder) on the coin at just over$40 including shipping and have been very pleased and guilt-free since. This all happened because of the URL and subsequent image error. Apparently, the seller entered the wrong URL for the image and none of the potential bidders on ebay that looked at the image figured out that it was not the coin described, or they simply didn't figure out how to determine what the seller's URL would b for the proper image. Overall, I obtained a superbly toned coin for almost nothing because the seller did not check his listing; never answered his email and other bidders didn't pay attention to the details of the coin. There have been other fortuitous auction wins over the years, but these stand out as different examples of understanding the paradigm used by the auction venue. To all who would bid in an auction environment; understand the parameters and formulate a plan before you jump in. It can be very rewarding.